Born in Dubuque, Iowa,  he was the third of six children of Charles R. and Dorothy (Haxby) Simplot. His maternal grandmother was English, as were both parents of both his maternal grandfather and paternal grandmother. Both of his paternal grandfather's parents were French. A year later in 1910, the family relocated a thousand miles (1,600 km) west to homestead in the newly- irrigated Magic Valley of south central Idaho; the Minidoka Dam on the Snake River was completed a few years earlier. Simplot retired as president of his company in 1973, but remained as chairman until 1994. He held the title of Chairman Emeritus until his death in 2008. 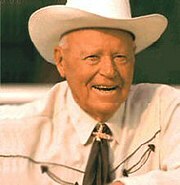 Simplot received an honorary degree from Utah State University in Logan in 2001,  honoring him for his many contributions to the agricultural industry of America, particularly the Intermountain West. Further enhancing his enormous wealth, the J.R. Simplot Company provided startup capital in the early 1980s for the fledgling Micron Technology, a Boise-based manufacturer of computer memory chips. Additionally, he invested heavily in Remington Oil. In 1961, Simplot financed the Brundage Mountain ski area near McCall, two hours north of Boise. The Simplot Company sold its 50% interest in Brundage in April 2006 to the longtime co-owner, the DeBoer family. In the early 1950s, Simplot was the benefactor to the fledgling Bogus Basin ski area near Boise when it had financial difficulties; the base area lodge is named in his honor. Simplot's first marriage was to Ruby Rosevear of Glenns Ferry, whom he had met on a blind date; he proposed to her in his Model A Ford in 1931. After 29 years and four children, the marriage ended in divorce in 1960, when she suddenly left Simplot for another man. Years later, Simplot admitted that while he was growing his business empire in the 1950s, he had not spent enough time with his family. ^ a b "#89 John Simplot & family". Forbes. Retrieved 2008-05-30. ^ a b c Miller, John (May 26, 2008). "Potato mogul J.R. Simplot dead at 99". Moscow-Pullman Daily News. (Idaho-Washington). Associated Press. p. 3A. ^ "#80 John Richard Simplot and family". Forbes. 178. 2006-09-21. ISSN 0015-6914. Retrieved 2007-06-30. ^ "Mr. Spud". Retrieved 2008-05-30. ^ "Simplot Australia - Introducing Simplot Australia". Simplot.com.au. Retrieved 29 March 2019. ^ "Simplot: Farmboy who never went to high school turns potatoes into biggest fortune in Idaho". Idaho Statesman. May 25, 2008. Retrieved 2008-05-30. ^ "Simplot Family Says Boise Mansion to Be Torn Down". KTVB. January 4, 2016. Archived from the original on 2016-01-07. Retrieved January 4, 2016. ^ "Idaho's richest citizen will celebrate his 98th birthday from a bed in Phoenix". Archived from the original on 2014-08-30. Retrieved 2007-01-04. ^ "J.R. Simplot's back in Boise". Archived from the original on 2014-08-30. Retrieved 2007-01-23. ^ "Morris Hill Cemetery walking tour: J.R. Simplot". Idaho: City of Boise. Parks & Recreation. Retrieved October 1, 2015.